Annie Android: Automated Affection Annie Android has her eye on that handsome Mailbot, but is shocked to discover that she has been assigned to be another robot's partner! 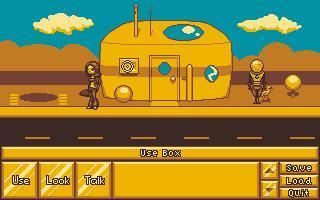 Help Annie win the heart of Mailbot and defeat the nasty RoboHQ! "A charming adventure surrounding one robot's quest for love, Ben manages to make 6 colors go a long way. Aside from a few pixel hunts and the game being very short, it's one for every agser's play list!" There's a definite style emerging in some ags games. Maybe the "look" is specific to games made by those two guys. Very stylish if you like pixel art (who doesn't around here?). The music is very cool and complete with a Devo-esque theme song. One obstacle toward the very end was a little frustrating and took me a while because you had to walk somewhere fairly specific, and it was too easy to click on the wrong thing. Aside from that, though, puzzles were just right in terms of difficulty - not too difficult, but not total "gimmes" either. This game is a lot of fun and I highly recommend playing it if you're in need of a fix. This is a short and sweet game, good for a day when you've just got an hour or so to play a quick game and don't want to get immersed in a massive plot. Nice little game with that old-school adventure feeling but without any pixel-hunting. A terrific choice for Pick of the month! This is a great example of AGS's potential being fully realized, with gusto. Catchy, fun, intuitive, and very sweet. Buen trabajo, guys. One of the better games I've played here. Cute story, and quality that matches some professional games. A real gem. Awesome lo-fi robo soundtrack, lovely graphics, story, atmos. Highly enjoyable. Another lovely short game from Ben. This is pretty much exactly what a short game should be. Absolutely fantastic all around. As many others have said: cute little game. If I may add something more, I reccomend this one expecially for newcomers to adventure gaming, since it's catchy, charming, fairly easy without being obvious and fast. Cute little game. Nice animations and puzzles that are neither too hard nor to easy. Recommended. Very cute game.I loved the graphics, the story wasn't uniqe but It doesn't need to be. Indeed, there is a marvellous game to be found here, caviar to the general, I say! But - alas! - my friends, I see that violence of a most ignoble kind, mean, treacherous, crooked, has snuck into the once loveable Chandlerian adventure world...but so be it, by the beard of St. Quorx - art always re-enacts nature, and sadly, we live in a universe where force has to be applied to be able to go your own adventurous way felicitously. Well, the game is sure "appaling", with the story being weird and all, this game's a must. This game has written Ben all over it and sports finely crafted animations, a stylish and convincing world where robots and androids live in their very own strange ways, a small and well wrapped-up story... and TONS OF CHARME. There's love in any of these limitedly-hues pixels. It's a short game with rather easy, logical puzzles too, so any newcomer to the genre should take the chance to see our most beloved genre in action. Very cool graphics with some brilliant Sci-Fi effects and humour! Nothing less expected from the dude that brought Trance-Pacific. A game with a really original setting, great characters and a cute story. I'm impressed that the visuals can be that beautiful with the low resolution und the few colours. Hehe, I like the opening music. This is a very pleasant game, with a nice interface. Fairly easy game, but fun nonetheless. A nice cute short game! Definatly worth a try!